It’s council clean up time in my ‘hood. This time I resisted temptation. I threw out but did not pick up. Though I do admit that in the past I have scored some awesome finds from a 3 seater bench seat and a bookcase to kids plastic seats and outdoor toys. This time I was so disciplined. I didn’t even cruise around in the car “just looking”. And then on Monday we took the pram to the park. 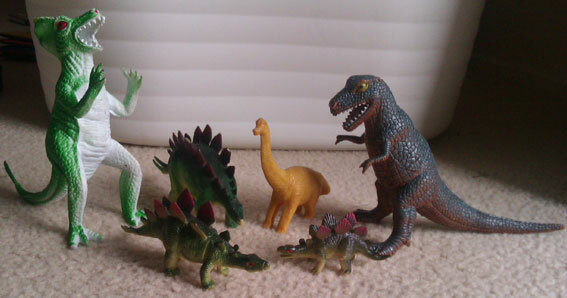 A critical error as it turns out because on the way home my son found a stash of toy dinosaurs! What’s a girl to do – stick to my principles or just take ’em? Of course we took them. It was so cute watching the kiddies “roaring” in the double pram all the way home. What’s the best council cleanup treasure you have ever found?